CALGARY, Alta. 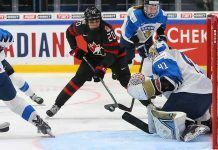 – Twenty-three Canadian players pursuing their professional hockey careers overseas will be skating under their nation’s flag during the three-day Deutschland Cup, Nov. 4-6 in Augsburg, Germany. 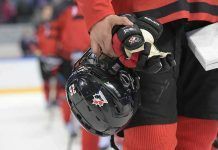 Hockey Canada and Deutschland Cup general manager, Sean Burke (Windsor, Ont./Montreal, NHL), have confirmed the Team Canada roster in advance of the pre-competition camp, which takes place in Budapest, Hungary, Oct. 31-Nov. 2, and includes an exhibition game against the Hungarian national team on Nov. 1. · Defenceman Jamie Fraser (Sarnia, Ont./Vienna Capitals). Earlier this month, Hockey Canada announced the return of Dave King (Saskatoon, Sask.) to Team Canada as head coach of the Deutschland Cup squad; King will lead the coaching staff which also comprises assistant coaches Mike Pelino (Welland, Ont. ), Luke Richardson (Ottawa), and Mike Stewart (Calgary). This will be the red-and-white’s first appearance at the Deutschland Cup since 2014. Canada has taken part in the tournament on 17 occasions (1992-2006, 2008, 2010, 2012, 2014), winning four gold medals (2000, 2002, 2005, 2008). Canada’s National Men’s Team opens the Deutschland Cup on Nov. 4 against Switzerland; the team plays Slovakia on Nov. 5, and Germany on Nov. 6.